It's been here since they were both born. The incessant need to constantly compare them to other kids. Are they sleeping like normal kids? Are they crawling or walking when they should? Are they talking when they should be? And I see this starting to escalate as Harper is beginning preschool. I see some kids her age reading and Harper barely knows her letters (not for a lack of trying on my part) and I have panic attacks. What if she is behind? I feel like I'm constantly trying to get around other 3 year olds and listen to them talk to see where Harper is on her speech. Obviously she is delayed because of her hearing but I also wonder socially and physically where she lines up. And the same for Hollis. It keeps me up at night worried about how each girl will do as they grow up. This has just been on my mind SO much lately as Harper moves into preschool both in school and at church. I am trying to hard to set my "momma mind and heart" and focus on this. I honestly have never had the desire (even before I had kids) for them to be the smartest kids at school. I would love it if they were but that just doesn't seem like the most important thing to me. I don't need them to be super athletes - but if they were I would be proud I'm sure. I know kids all develop at different rates. I think about myself - My mom has told me my whole life how I was reading books at 3 and I started school at 4 and teachers would take me around to let others hear how well I read for such a young age. So you would think after all that I would be a brain surgeon. I always say I peaked in the first grade. I made good grades in school but I was never a national merit scholar (I know all you grammar police out there know this if you read my blog). I still managed to graduate college and have a pretty good business career and now I'm using my smarts to change diapers. And I have a pretty great life. I think I have to continually put myself in check almost every day. 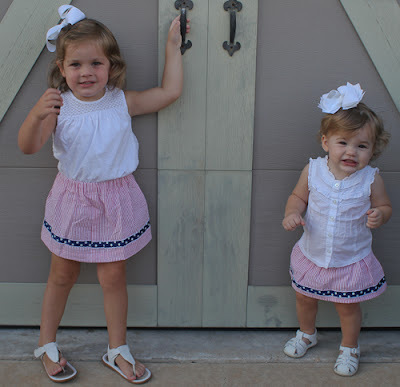 Even though panic starts to arise when I think about how Harper will do in preschool - I remember that honestly I only care about two things when it concerns my girls. I don't care if they are the smartest girls in school. I don't care if they are cheer leading captains. I don't care if they are homecoming queen. My desire for both girls is that they are kind and giving and that they love Jesus with all their hearts. I will cheer and clap and jump and holler a whole lot more if they will sit by the kid who is a little different in the cafeteria and offer to share their cookies. Or if they will dry the tears of the kid in their class who gets hurt. Or if they are the first to volunteer when a friend has a need. I will be thrilled to death if they save all their allowance money to help orphans or buy poor kids Christmas gifts. My heart will soar if they will share Jesus with their classmates or invite friends to church. I'm already so full of pride when Harper demands we pray at every meal and then says the sweetest prayers. That's better than her being a child prodigy to me all day long. Those things are eternal. I know being kind and loving God won't pay the bills but they will buy up mansions in heaven. So I may spend more time teaching kindness or singing "Oh how I love Jesus" and praying with them than I do teaching multiplication tables or Latin verbs. My biggest prayer as a mom is to train their hearts and not their heads. I know that's NOT the popular way or what seems to be what most people do. And it's a conviction to me to be the example - which means I have to shape up in where my priorities lie. BIG TIME. Loving God and loving His people to me is what matters most.